Thank You Osho for these very wise words. I always feel sad when I see people picking flowers, I know we all appreciate the beauty of the flower and want to take it home, place it in a jug of fresh water and have the beauty in our home for a few short days, however; when we pick the flower we take away it’s life force and it dies. 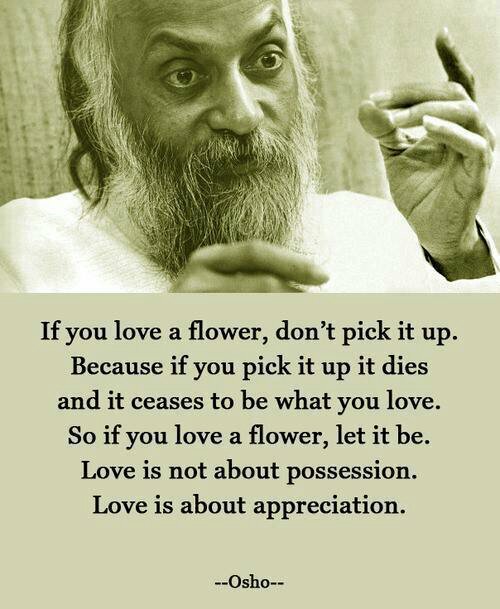 This is also the same for love, as Osho quite rightly says, Love is to be appreciated and it should not be possessed ! How often do we strangle our love by wanting to own the other person, tie them down to our love and only our love, we can be so possessive that we hurt the other person by smothering them with our love and confining them to our love! We don’t mean any harm but ‘Love hurts’ and we want the other persons love all for ourself. Love is a beautiful thing, but it is not always the easiest thing to deal with, Love can drive us crazy, love can make us jealous, love can make us possessive, love can be blind, love can break our heart….but love is JOY, love is happiness, love is compassion. Wonderful post ad quote! Namaste . . . I feel the same about seeing caged birds…..why cant we just enjoy seeing them in the trees, free?